Former Malaysian premier Najib Razak's trial over a massive financial scandal that contributed to his government's downfall was postponed Monday, in a blow to slow-moving efforts to bring the disgraced politician to justice. Najib had been due to go on trial Tuesday for the first time over allegations linked to his involvement in the looting of Malaysian sovereign wealth fund 1MDB in a fraud that reverberated around the world. Billions of dollars were allegedly stolen by Najib and his cronies from 1MDB, which was set up to help develop Malaysia's economy, and spent on everything from high-end real estate to expensive artworks. Najib, who allegedly received huge sums from the fund into his personal bank accounts, has denied any wrongdoing. But the ex-leader's lawyers filed an application for the trial to be delayed pending an appeal on a technical matter. The Court of Appeal on Monday agreed to the postponement for an unspecified period, V. Sithambaram, a criminal lawyer on the prosecution team, told AFP. "It won't be delayed too long," he said, adding he hoped the appeal would only take a week or two. The scandal was a major factor in the shock poll loss of Najib's long-ruling coalition in May. Since being ejected from power, Najib has been arrested repeatedly and hit with a total of 42 charges linked to 1MDB. He denies any wrongdoing. 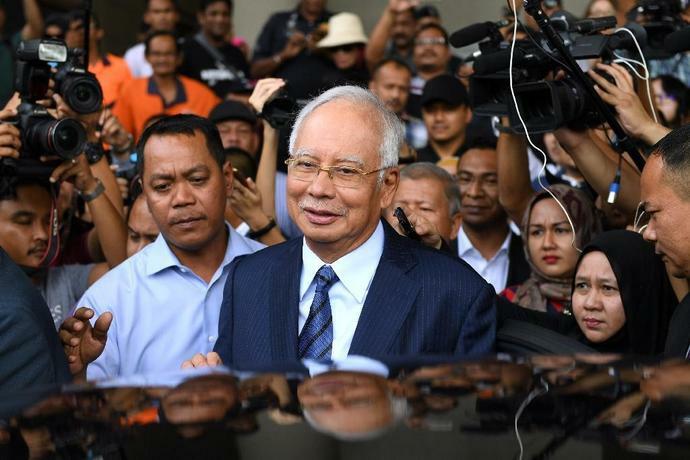 The trial, originally scheduled to begin Tuesday, is on seven charges related to allegations Najib pocketed 42 million ringgit ($10.3 million) from SRC International, a former unit of 1MDB. Getting legal proceedings underway will relieve pressure on the new government amid growing public unease about slow progress on 1MDB, although observers say that Najib's defence team has been using delaying tactics. James Chin, a Malaysia specialist at the University of Tasmania, said the postponement was a "huge setback" for the new government led by Prime Minister Mahathir Mohamad. "They needed the trial to regain support from the public," he told AFP. But Bridget Welsh, a Southeast Asia expert from John Cabot University, played down the significance of the postponement, saying "delaying tactics" were an expected part of the defence's strategy. The former leader and his defence team have portrayed the cases against him as revenge by the new government led by Mahathir, Najib's mentor-turned-nemesis, who came out of retirement in his 90s to oust the scandal-mired ex-premier. As he awaits trial, Najib has gone on a bizarre publicity blitz in recent weeks, performing a cover of a 1970s R&B hit accompanied by backing singers, attacking the new government on social media and seeking to present himself as a man of the people.